After all these years, Genesis still does. Fans of Sega systems, listen up. There's a whole new way to show your appreciation. 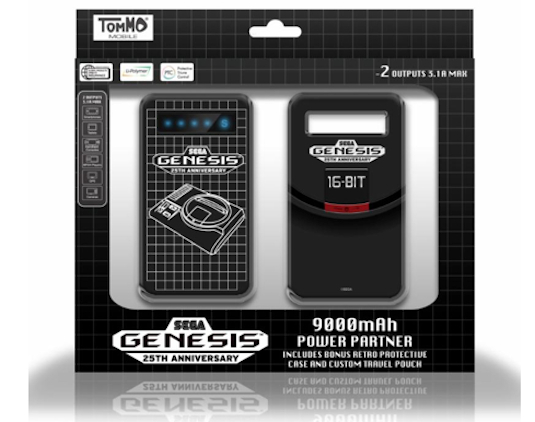 Tommo Mobile announced a series of new accessories based on classic Sega gaming systems, including the Sega Saturn and the Sega Genesis, which celebrates its 25th anniversary this year. The devices will launch starting this month, and include classic-themed phone cases for iPhone 5 and 5S, which include a bonus screen protector to match the theme of the case. In December, Tommo will roll out the next products, including a Bluetooth 4.0 compatible Premium Sega Genesis Replica Bluetooth Speaker, featuring stereo sound, NFC, AptX and Multi-pairing support, a built-in rechargeable battery and a 3.5 mm headphone jack. Also releasing in December are new Sega Genesis and Saturn Power Partner battery chargers, with full-encased aluminum bodies, dual charging ports, a retro-style protective case and custom travel pouch. The classic cases, which also include a Game Gear design, will go for $24.99 apiece; the Power Partners will sell for $69.99 each; and the Replica Bluetooth Speaker will go for $89.99. No word yet if Joe Montana SportsTalk Football quotes are included. We're guessing no.